March brings St. Patrick's Day and Easter this year. Usually I refuse to do anything related to Easter on the blog before St. Patrick's Day... but this year Easter is earlier so you'll see bunnies and egg crafts and activities next to shamrock ones! This month for our Virtual Book Club for Kids we are reading The Tales of Peter Rabbit by Beatrix Potter and doing a bunny color sorting activity. In The Tales of Peter Rabbit by Beatrix Potter we are introduced to Peter, Flopsy, Mopsy, and Cottontail and their adventures in Mr. McGregor's garden. 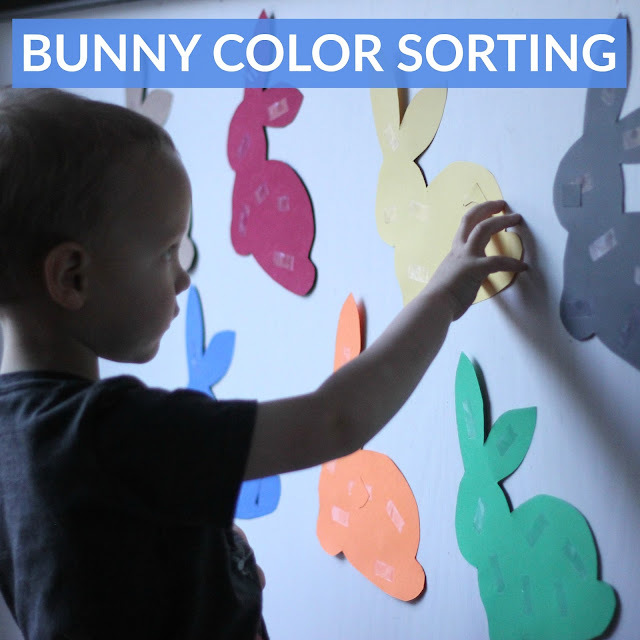 For our book-inspired activity this month we cut out some bunnies from a variety of colors of paper and made a simple color sorting activity. Several of our co-hosts shared other fun book-inspired activities as well, so make sure to scroll down. To get prepped we printed bunny outlines onto colored cardstock and then we cut them out. I cut 3 pages at a time so this went quickly. Next the kids cut and/ripped up the extra scraps of colored paper and we put it all in a big pile on the floor. After that we used painter's tape to stick a variety of colored bunnies to the wall. Then we covered the front of the bunnies with several pieces of double sided tape. After that, the kids started sorting and sticking. They looked for color scraps that matched each bunny and stuck them onto the front of the bunny in the spots where there was tape. This was such an easy activity but great for working on visual discrimination, color names, and fine motor skills like cutting and tearing. This activity can be played again and again as you add more tape to the bunnies. Have you read The Tales of Peter Rabbit with your kids yet? Here are some other book-inspired activities from our co-hosts. What a cute idea! Our son would love this! My kids would love this idea! I love how you worked on the vertical wall! Thanks so much for sharing! 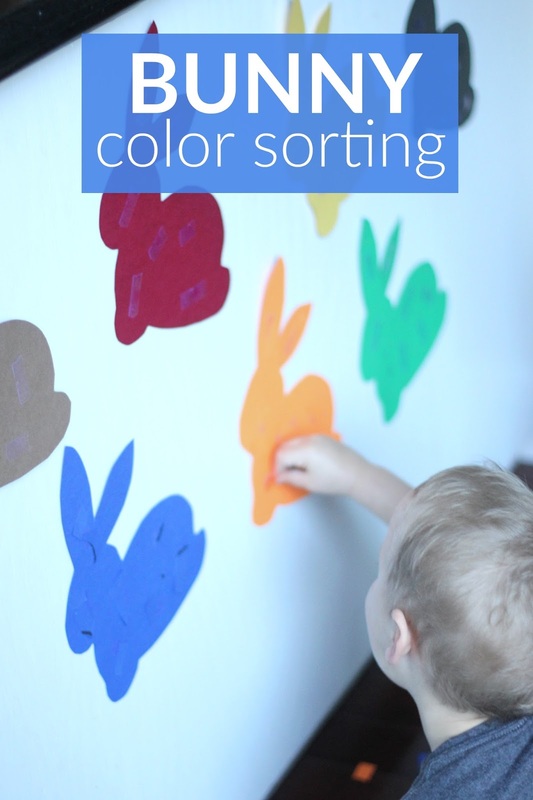 I can't wait to try this color matching activity with our Mason CreativeTots preschoolers! I love this collaborative collage! What a great way to get the kids working together, while learning & moving!